New Tech To Change Job Search Forever | Challenger, Gray & Christmas, Inc. The job search has changed dramatically in the past few years, primarily due to technological advances. No longer must job seekers pore over want ads in newspapers and make cold calls trying to meet with employers. While advances in online job search techniques have made it easier for both job seekers and employers, new technologies will likely dramatically change not only the way people find open positions, but how they are assessed and hired by employers, according to one workplace authority. “Staples in the job search still remain, including the resume, networking, and interviewing. However, recruiters and job seekers alike are increasingly turning to new technological tools, such as apps and video resumes, to aid in candidate selection and the application process,” said John Challenger, Chief Executive Officer of global outplacement and executive coaching firm Challenger, Gray & Christmas, Inc. Many recruiters today utilize Google and LinkedIn to find talent, rather than paying for databases. Some companies even mandate that every new application they receive go through a specific Google screening process – meaning the first page of a candidate’s Google results matter significantly more. A recent survey conducted by Challenger found that 78.9 percent of recruiters check potential candidates on social media and Google, and 75.5 percent do this initial check before they contact the candidate. That’s why social proofs, testimonials, and public recommendations are important in the job search. They greatly reduce the perceived risks of an individual as a candidate. The Bureau of Labor Statistics found that on average, when a new hire leaves within three months, it costs an organization one and a half times their annual salary. With companies looking to save money and find the best talent in a tight labor market, recruiters will use any method possible to vet job seekers. One of the largest shifts in the job search is that resumes and cover letters are no longer read on paper. To further ease the process of screening candidates, many companies have implemented tools to bring the volume of resumes they receive down to a fraction of what they started with. Many larger organizations rely on applicant tracking systems, or ATS, to assist in a pre-filter process when reviewing resumes. The systems work by scanning resumes for contextual keywords and phrases, mathematically scoring them for relevance, and allowing only the most qualified ones through for actual human review. Generally, this saves HR managers and recruiters the time and trouble of sorting through irrelevant, underprepared, or weak resumes to find the impressive candidates. However, this also means a worthy resume could slip through the cracks if formatted incorrectly or missing keywords. Companies are constantly looking to reduce costs and integrate the newest and best technology into their operations. For instance, many companies have stopped conducting face-to-face interviews with candidates who are not local. Rather, they have switched to video interviews. Although this may cut costs for the company, both the candidate and the hiring manager can lose out on some very important interpersonal interactions in video interviews compared to physical interviews with both parties present. “Virtual reality technology has the ability to inject more personality into remote meetings and interviews. VR technology has the capability to create environments and ‘teleport’ other people into the environment to be with you. By offering the opportunity to create a virtual interview space and invite other candidates, the VR system is effectively restoring some of the aspects of a face-to-face interview that are lost during video interviews, where both parties are just pictures on a screen to one another,” said Challenger. Currently, VR caters to the auditory and visual senses, but lacks in other areas compared to face-to-face interaction. However, senses such as smell and the ability to feel temperature are in development, and eventually we will be able to accurately assess a person’s handshake and body language through VR technology. With the development of mobile technology in business, many mobile apps have emerged to streamline and simplify the entire job search, allowing for our increasingly smartphone-dominated society to network, search, apply, and communicate more effectively and on their own time. Employers in the U.S. welcome the rise of mobile job applicants, despite the fact that only 10 percent of Fortune 500 companies are currently able to meet this demand by offering a mobile-friendly application process. A survey conducted by Censuswide revealed that 78 percent of people in the U.S. would apply to jobs on their mobile devices if the process were simplified. “In addition to convenience, job seekers want the ability to choose when they conduct their job search, with 40 percent citing the ability to search on the go as a top reason for turning mobile. This results in encountering more opportunities they might not have found otherwise,” said Challenger. For the past ten years, LinkedIn has been the leading platform to build a professional network. Now, start-ups are beginning to build an audience of users who are choosing an alternate path to better protect their information and take control of their networks. For example, Caliber is an app described as a search engine for business contacts. The app accesses your social and professional networks, letting you search for and chat with connections based on their professional background. The app empowers users to get the most out of their networks through simple, non-invasive, and direct communication. According to the CEO, the app has more than 4 million searchable profiles, including 1 million in New York and San Francisco. Additionally, the app facilitates communication at a rate of 23 percent – meaning one in five requests is accepted. Other apps, such as Weave and Reach, utilize a service similar to Tinder, deploying a matching algorithm that allows users to swipe through potential professional contacts in their area. The founder of Weave states that his app provides a more discrete, convenient approach to networking compared to events like blind reach-outs, which can be a hassle. Reach allows networkers to find professionals by proximity, visited places, or interests, in real time. Along with the addition of job search-assisting apps, candidates may also create video resumes. Creating a video resume (sometimes called a profile video or video profile) is an excellent way to stand out among other candidates. Lasting typically 60 seconds, these videos provide the best first impression to an employer – allowing for the employer to actually see you and assess your communication skills, personality, and charisma, all before a physical interview. Video resumes are more of an enhancement, not a replacement, to the traditional resume. They offer a chance to expand and highlight the skills you have to offer for a job, rather than just speaking to what is already on your resume. These clips let you speak for yourself, allowing you to directly address why you should be considered for the job. Although video resumes put a “face” on your resume, the biggest concern immediately falls to discrimination. However, according to the EEOC (Equal Employment Opportunity Commission), video technology is completely compliant in the hiring process. Employers today are extremely careful about practices during hiring that could lead to accusations of discrimination. However, video resumes are still gaining acceptance as standard hiring material, so there is more room for improvement. Plus, if an employer were to discriminate toward an individual because of a video resume, it raises the question of what would stop them from doing the same in an in-person interview. Video resumes began to pick up in the 2000s once the Internet became an important aspect of everyday life – and online video creation became much easier with tools like webcams, smartphones, and YouTube. Today, platforms like Spark Hire are catered toward creating and sharing professional video resumes easily and efficiently. Also in the realm of video resumes and interviews, employers, politicians, and even retail shops are expected to adopt technology that can detect facial expressions to tap into peoples’ thoughts and reactions. ooVoo, a U.S. company which offers a video chat app used by more than 120 million smartphone and tablet owners, has been developing software that can read facial expressions. Political pollsters have begun testing the technology in the U.S. and are expected to use it in the next presidential election to gauge reaction to speeches and debates. Additionally, ooVoo has said they are speaking to major global employers who are interested in utilizing the technology for their interviewing processes. With more and more recruiters conducting interviews over video chat, this new technology could provide them with even more data on candidates by measuring how their mouth, eyes, and other facial features move as they answer questions. “While this new technology could potentially create great benefits to employers, measuring cultural fit and enthusiasm, there are privacy concerns that come with this technology. Job seekers will likely want to opt in to this interview option, rather than have it sprung on them,” said Challenger. One website, interviewing.io, an anonymous interviewing platform that connects you with employers/candidates, experimented with voice modulation to mask gender in technical interviews. The point of the platform was to eliminate any discrimination between interviewers and interviewees, but they noticed this data and decided to build a voice-masking software to further the anonymity of the interviewee. 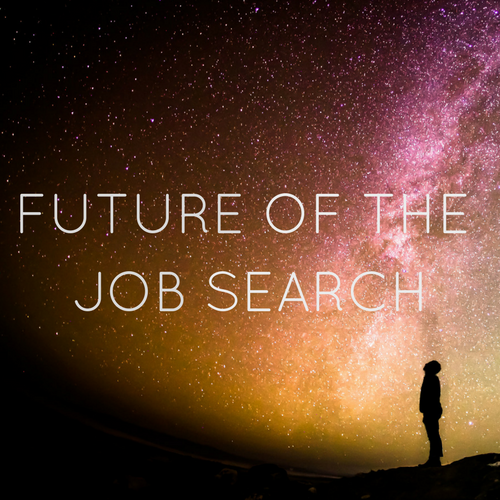 “The future of the job search includes increased use of technology that makes the job search more convenient and accessible, as well as the ability to better assess candidates quickly and efficiently on their merits. It will be exciting to see what other new technologies may pop up in the job search or how existing technologies will be adopted,” said Challenger.